The same floods that prompted authorities to breach a levee near Cairo, Illinois, has started forcing residents from their homes farther south along the Mississippi River. 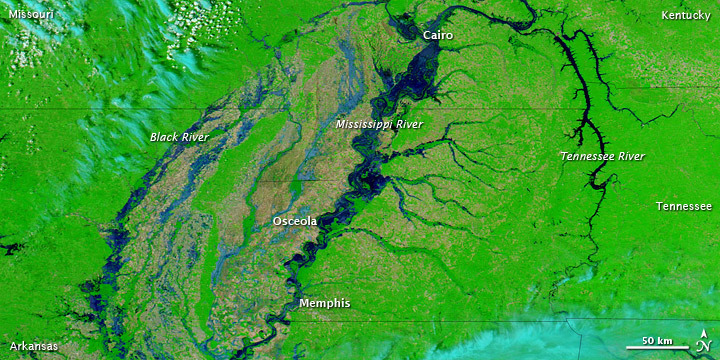 On May 6, 2011, the Advanced Hydrological Prediction Service (AHPS) reported that the Mississippi’s water level had reached 46.68 feet (14.23 meters) at Osceola, Arkansas, and 46.14 feet (14.06 meters) at Memphis, Tennessee. At both locations, the Mississippi is in major flood stage and expected to continue rising. 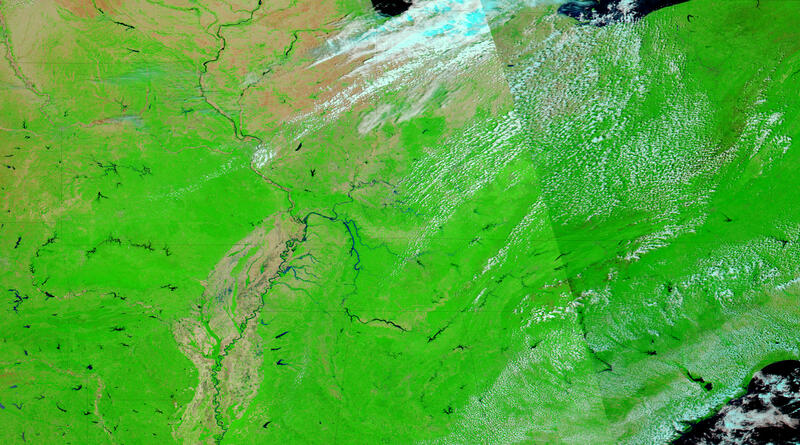 The Moderate Resolution Imaging Spectroradiometer (MODIS) on NASA’s Aqua satellite acquired the top image on May 5, 2011, and the bottom image exactly one year earlier. Both images use a combination of infrared and visible light to increase the contrast between water and land. Water varies in color from electric blue to navy. 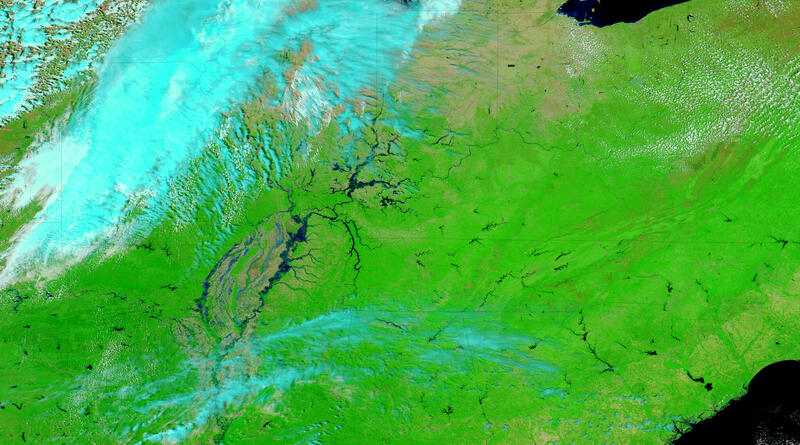 Clouds (visible in the 2011 image) are pale blue-green. Vegetation is green, and soil is brown. 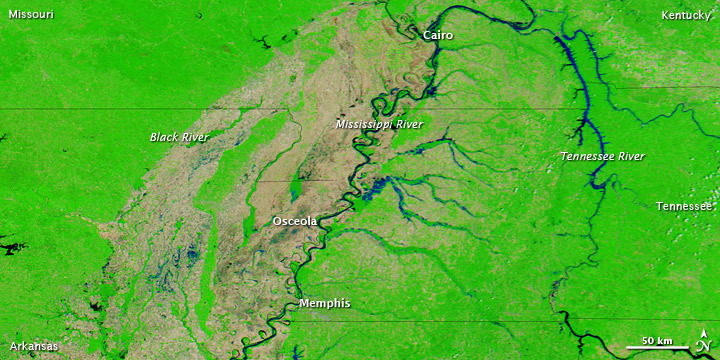 Compared to more typical conditions in 2010, the Mississippi River is substantially swollen in 2011, from north of Cairo to south of Memphis. 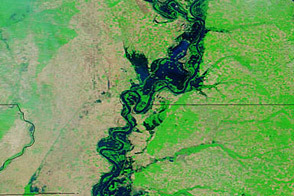 In the west, the Black River is also swollen, and large areas of standing water appear between the Black and Mississippi Rivers. 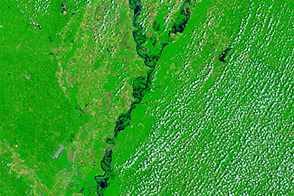 The Tennessean reported that some residents of Memphis were starting to leave their homes in anticipation of continued flooding, and floods had begun to affect parts of the Mississippi Delta. 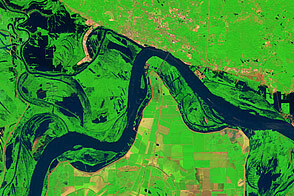 Acquired May 5, 2011, and May 5, 2010, these false-color images compared flood conditions in 2011 to calmer conditions one year earlier. Associated Press. (2011, May 6). 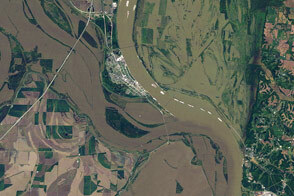 Flooding begins in Mississippi Delta; Memphis residents moving out. The Tennessean. Accessed May 6, 2011. National Weather Service. Advanced Hydrologic Prediction Service. Accessed May 6, 2011.